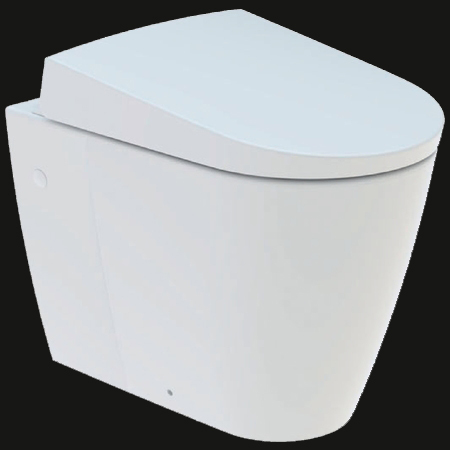 Aquaclean bidet toilet seats and toilets are known worldwide. They are used in many care centres, hotels and homes. Water has always played a central role in human life. This liquid element is an essential part of our daily personal hygiene routine. In many cultures it is normal to wash with water after using the toilet, because it produces the cleanest and most pleasant results. It is surprising that we are content mainly to use paper. Geberit AquaClean is a toilet which has returned to the use of water for cleaning, the original source of freshness and cleanliness. An adjustable spray of water cleans your bottom gently and pleasantly. It is easy to use and effective. Depending on the Geberit AquaClean model, the shower feature is enhanced by additional features such as an oscillating shower arm, the lady shower for feminine hygiene, a pulsating massage shower, warm-air dryer, remote control or memory function. Geberit AquaClean combines sophisticated design, comfort and functionality. It is available as an add-on toilet seat or a complete toilet system depending on the customer’s requirements and living arrangements. The same standards of quality and comfort apply to all the models. The only difference lies in the level of equipment, which ranges from simple to luxurious. Geberit AquaClean also sets high standards for the appearance of its products. 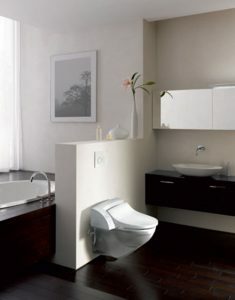 The toilet seats are easy to install and fit perfectly on all standard toilet models. 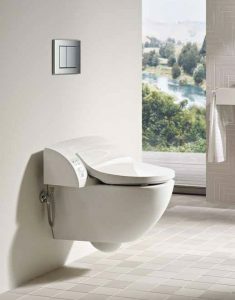 The elegant design of the complete Geberit AquaClean toilet systems, which are available in wall-hung and floor-standing versions, will enhance any bathroom.